Over the course of his practice Haswell has disentangled the limits of Digital Audio Tape (DAT), the Sound Designer II software, Xenakis' UPIC system and analogue synthesis systems in a relentless pursuit of the new in the known. Yasunao Tone’s audio investigations have regularly placed him within the systems and processes he has developed to generate works. His Wounded CD works and his interactions with data entry and software interfaces, such as graphic tab lets in 495.63 (2007) and his MP3 Deviation software employed on this release all provide a path whereby the human input creates a juncture in the 'normal' operations of the tools at hand. Convulsive Threshold is the result of years of research and experimentation. Haswell’s systems of hybrid analogue/digital audio generation are one of the starting points for the Convulsive Threshold collaboration, and in part define its sonic palette. The results of his synthesis become subjected to Tone’s MP3 Deviation techniques, modified and manipulated in response to deviated MP3 files. The results are a glorious spiral of sound, space and dynamics, a hyperactive Mandlebrot set which exudes relentless reconstruction, chaos and as a result, presents an entirely new form. 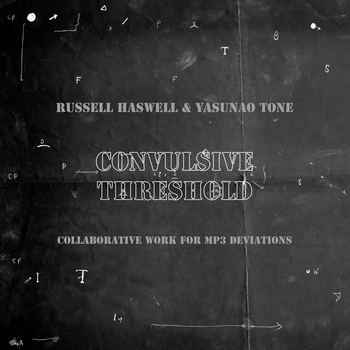 Convulsive Threshold forms a dialogue which sees two of the most recalcitrant sound artists active today coming together as one.